Aparajito (Bengali: অপরাজিত Ôporajito; The Unvanquished) is a 1956 Indian Bengali drama film directed by Satyajit Ray (1921–1992), and is the second part of The Apu Trilogy. It is adapted from the last one-fifth of Bibhutibhushan Bannerjee's novel Pather Panchali (1929) and the first one-third of its sequel Aparajito (1932). It starts off where the previous film Pather Panchali (1955) ended, with Apu's family moving to Varanasi, and chronicles Apu's life from childhood to adolescence in college, right up to his mother's death, when he is left all alone. When Ray started making Pather Panchali, he had no plans of following it up with a sequel. The critical and commercial success of the film prompted him to start making Aparajito. Unlike his previous venture, where he stayed faithful to the novel, Ray took some bold artistic decisions here, such as portraying the relationship between Apu and his mother in a very different manner from the book. As a result, in contrast to its predecessor, the film was not received well locally; Ray recalled that "as for the suburban audience, it was shocked by the portrayal of the mother and son relationship, so sharply at variance with the conventional notion of mutual sweetness and devotion". Critical reception outside of India, however, was overwhelmingly positive. It won 11 international awards, including the Golden Lion and Critics Award at the Venice Film Festival, becoming the first ever film to win both. Veteran film-maker Mrinal Sen said he considers it to be one of the best Indian movies he had ever seen. Bosley Crowther said that "It is done with such rare feeling and skill at pictorial imagery, and with such sympathetic understanding of Indian character on the part of Mr. Ray, that it develops a sort of hypnotism for the serene and tolerant viewer." The critical acclaim this movie received encouraged Ray to make another sequel, Apur Sansar (1959), which was equally well received, and thus concluded one of the most critically acclaimed movie trilogies of all time, as Roger Ebert later pointed out—"The three films ... swept the top prizes at Cannes, Venice and London, and created a new cinema for India — whose prolific film industry had traditionally stayed within the narrow confines of swashbuckling musical romances. Never before had one man had such a decisive impact on the films of his culture." In 1920, Apu (Pinaki Sen Gupta) and his parents, who have left their home in rural Bengal, have settled into an apartment in Varanasi where his father Harihar (Kanu Banerjee) works as a priest. Harihar is making headway in his new pursuits: praying, singing, and officiating among the ghats on the sacred river Ganges. Harihar catches a fever and soon dies, however, and his wife Sarbajaya (Karuna Banerjee) is forced to begin work as a maid. With the assistance of a great-uncle, Apu and his mother return to Bengal and settle in the village Mansapota. There Apu apprentices as a priest, but pines to attend the local school which his mother is persuaded to allow. He excels at his studies, impressing a visiting dignitary, and the headmaster takes special interest in him. Within a few years, the teenaged Apu (now played by Smaran Ghosal) has done well enough to receive a scholarship to go to Calcutta for further studies. Sarbajaya feels abandoned and frightened by this, but gives in and lovingly packs his suitcase. Apu travels by train to the city and starts working at a printing press, after school hours, to subsist. He becomes more accustomed to the city life and feels out of place in the village. Sarbajaya expects visits from him, but he visits only a few times. Her loneliness and yearning for her son continue to grow. She becomes seriously ill, but does not disclose her illness to Apu, lest his studies get disturbed. When Apu finally comes to know about her poor health, he returns to the village to find that she has died. Bhabataran, Apu's great uncle, requests that he stay there and work as a priest. Apu rejects the idea and returns to Calcutta. Aparajito was based on the last fifth of the novel Pather Panchali and the first third of the novel Aparajito by Banerjee. The novel Pather Panchali is a classic bildungsroman (a type of coming-of-age story) in the canon of Bengali literature. It first appeared as a serial in a Calcutta periodical in 1928 and was published as a book the next year. According to Ray's biographer, Robinson, among the three films of the Apu trilogy, Aparajito bears the closest resemblance with its literary source. Banerjee's depiction of the mother-son relation fascinated Ray. Robinson writes: "Their relationship had some echoes on a purely psychological plane for him". Ray was in particular moved by Banerjee's "daring and profound revelation", that "for some time after Sarbajaya's death Apu becomes familiar with a strange sensation...his immediate reaction had been one of pleasure, like a surge of release...a delight in the breaking of bonds...there was no doubt he loved his mother, but the news of her death had at first brought him pleasure—he couldn't avoid the truth." Ray's wife Bijoya also voiced her concerns when she came to know the plot, asking him "Do you think people in our country will accept a son's relief at having won his freedom at his mother's death?" Ray was aware of the risk, saying "let's see what happens. After all, later Apu was full of regret at his initial reaction upon his mother's death. And as he realized, her death actually came as a very big blow to him." The novels had a female character named Leela who influenced Apu's alienation from his mother when he was living in Calcutta. After rejecting two aspirants, Ray found one actress to portray the character, but the actress was not allowed to act in the film by her fiancé. Eventually, Ray removed the character from the script reluctantly. Ray himself later commented that he thought Leela, with whom Apu had an understated affair, was a strong reason behind Apu's attraction of Calcutta, and that without Leela's presence in the film, Apu's attraction to Calcutta may seem to some extent artificial. "I'm never sure," he said, "whether Apu's attachment to the city without the element of the girlfriend is strong enough, the pull that the city exerts is a bit abstract." However, when he watched the movie later, he did not feel the absence of Leela. The fear of monsoon rain had forced the art director, Bansi Chandragupta, to abandon the original plan to build the inner courtyard of a typical Benares house in the open and the set was built inside a studio in Calcutta. Mitra recalls arguing in vain with both Chandragupta and Ray about the impossibilities of simulating shadowless diffused skylight. But this led him to innovate what became subsequently his most important tool—bounce lighting. Mitra placed a framed painter white cloth over the set resembling a patch of sky and arranged studio lights below to bounce off the fake sky. Aparajito was filmed forty years ago, half way around the world, yet the themes and emotions embedded in the narrative are strikingly relevant to modern Western society (thus explaining why it is called a "timeless classic")....Aparajito is an amazing motion picture. Its rich, poetic composition is perfectly wed to the sublime emotional resonance of the narrative. For those who have seen Pather Panchali, Aparajito provides a nearly-flawless continuation of the journey begun there. Yet, for those who missed Ray's earlier effort, this film loses none of its impact. On its own or as part of the Apu Trilogy, Aparajito should not be missed. Roger Ebert said, "the relationship between Apu and his mother observes truths that must exist in all cultures: how the parent makes sacrifices for years, only to see the child turn aside and move thoughtlessly away into adulthood....It is about a time, place and culture far removed from our own, and yet it connects directly and deeply with our human feelings. It is like a prayer, affirming that this is what the cinema can be, no matter how far in our cynicism we may stray." During the Venice Film Festival, Penelope Houston, who was among the jury, broke protocol and told Ray personally: "I think it was magnificent". The chairman of the award ceremony, René Clair, was initially reluctant to give it the coveted prize; he eventually acquiesced, but not before saying to Houston: "I hope Ray will go away and learn how to make films!" The Japanese director Akira Kurosawa had an important film entered in that year's festival competition, Throne of Blood (Kumonosu-jō), which lost to Ray's film. However, many years later, Kurosawa's daughter generated a list of 100 films admired by him; this list quoted him as having affirmed the jury's choice as "ABSOLUTELY right" (though he misidentified the winning film as Pather Panchali). Emanuel Levy said: "Made in 1956 (and released in many countries a year later), 'Aparajito' indicates India’s processes of modernization and industrialization and their inevitable impact on both individual and culture. Nonetheless, in his upbeat outlook, Ray suggests that individuals can rise to the occasion and might not be compromised by the corruption that characterizes the society at large." Bosley Crowther, who had earlier given a lukewarm response to Pather Panchali, saying that the film was so amateurish that "it would barely pass for a rough cut in Hollywood", praised it, saying that "Mr. Ray's remarkable camera catches beauty in so many things, from the softness of a mother's sad expression to the silhouette of a distant train, that innuendos take up the slack of drama. Hindu music and expressive natural sounds complete the stimulation of the senses in this strange, sad, evocative film." At Rotten Tomatoes, Aparajito has a 93% fresh rating based on an aggregate of 15 reviews. 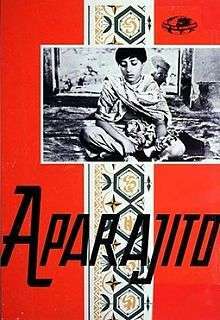 Aparajito won the Golden Lion at the 1957 Venice Film Festival and, to date, remains the only film sequel to ever win the grand prize at the prestigious Venice, Berlin or Cannes Film Festivals. Along with the Golden Lion, it received the Cinema Nuovo Award and the FIPRESCI Award Critics Award in the process becoming the first movie to win all three. Ray also won the Golden Gate awards for Best Picture and Best Director at the San Francisco International Film Festival in 1958, along with the Critics Award for this film. The film won the Bodil Award for Best Non-European Film of the Year at Denmark in 1967. The film was nominated for the Best Film and Best Foreign Actress at the 1959 British Academy Film Awards. In 1992, Sight & Sound (the British Film Institute's film magazine) ranked The Apu Trilogy at No. 88 in its Critics' Poll of all-time greatest films, while Aparajito itself was ranked separately at No. 127 on the same list. In 2002, a combined list of Sight & Sound critics' and directors' poll results included Aparajito in its top 160. In 1998, the Asian film magazine Cinemaya's critics' poll of all-time greatest films ranked The Apu Trilogy at No. 7 on the list. In 1999, The Village Voice ranked The Apu Trilogy at No. 54 in its Top 250 "Best Films of the Century" list, based on a poll of critics. In 2001, film critic Roger Ebert included The Apu Trilogy in his list of "100 Great Movies" of all time. In 2005, The Apu Trilogy was included in Time magazine's All-TIME 100 Greatest Movies list. Smaran Ghosal who played the role of adolescent Apu, at the age of 14, did only one more film, documentary Rabindranath Tagore (1961), also made by Ray, where he played young Rabindranath Tagore. Smaran died in 2008 in Kolkata, at the age of 64. Aparajito was preceded by Pather Panchali (1955) and followed by Apur Sansar (The World of Apu) in 1959. Together, the three films constitute the Apu trilogy. Pather Panchali portrays the childhood of Apu in their ancestral house. Apur Sansar depicts Apu's adult life, his reaction to his wife's premature death, and his final bonding with his son whom he abandoned as an infant. Ray did not initially plan to make a trilogy: he decided to make the third film only after being asked about the possibility of a trilogy at the 1957 Venice Film Festival, where Aparajito won the Golden Lion. The film is considered as the richest of three in terms of its characterization. Apur Panchali (2014) is a Bengali film directed by Kaushik Ganguly, which depicts the real-life story of Subir Bannerjee, the actor who portrayed Apu in Pather Panchali. According to Michael Sragow of The Atlantic Monthly in 1994, "The youthful coming-of-age dramas that have flooded art houses since the mid-fifties owe a tremendous debt to the Apu trilogy, which Terrence Rafferty has rightly called 'cinema's purest Bildungsroman'." Across the world, filmmakers such as Martin Scorsese, James Ivory, Abbas Kiarostami, Elia Kazan and Wes Anderson have been influenced by The Apu Trilogy, with many others (such as Kurosawa) praising the work. The technique of bounce lighting developed by the cinematographer Subrata Mitra for Aparajito has also had a profound influence on the development of cinematography. After Aparajito, Ray went on to make 35 more films, including feature films, documentaries and shorts. He worked on scripting, casting, scoring, cinematography, art direction, editing and designing his own credit titles and publicity material. He developed a distinctive style of film-making based on visual lyricism and strong humanism, as in his Apu trilogy. Thus Ray established himself as an auteur of cinema. The Academy Film Archive preserved the entire Apu Trilogy in 1996, including Aparajito. ↑ Ray 2013, p. 63. ↑ Ray 2013, p. 42. 1 2 Ray, Bijoya 2012, pp. 168. ↑ Das Gupta, Ranjan (2010). "I don't rank my films: Mrinal Sen". The Hindu. Retrieved 20 September 2014. 1 2 Crowther, Bosley (April 29, 1959). "The Screen: 'Aparajito'; Indian Movie Continues 'Pather Panchali' Story". The New York Times. Retrieved 20 September 2014. 1 2 Ebert, Roger (4 March 2001). "THE APU TRILOGY". Retrieved 24 September 2014. 1 2 Robinson 2003, p. 94. ↑ Gokulsing & Dissanayake 2013, p. 277. ↑ Gugelberger 1996, p. 173. ↑ Robinson 1989, p. 74. ↑ Sekhar, Saumitra (2012). "Pather Panchali". In Islam, Sirajul; Jamal, Ahmed A. Banglapedia: National Encyclopedia of Bangladesh (Second ed.). Asiatic Society of Bangladesh. ↑ Ray, Bijoya 2012, pp. 153. ↑ Robinson 2003, pp. 94–95. ↑ Ray, Bijoya 2012, pp. 167. 1 2 Robinson 2003, pp. 105. ↑ "Akira Kurosawa's Top 100 Films – Movie Forums". Retrieved 2015-05-20. ↑ Levy, Emanuel (5 August 2011). "Aparajito (1956)". Retrieved 1 November 2014. ↑ "Aparajito's Apu dies". The Telegraph (Kolkata). Calcutta, India. 12 July 2008. ↑ Wood 1972, p. 61. ↑ Bergan 2006, p. 497. ↑ Robinson 1989, p. 98. ↑ Ganguly, Ruman (29 March 2013). "Parambrata starts shooting for Apur Panchali". The Times of India. Retrieved 7 December 2013. ↑ Chris Ingui. "Martin Scorsese hits DC, hangs with the Hachet". Hatchet. Archived from the original on 2 November 2007. Retrieved 29 June 2006. ↑ "On Ray's Trail". The Statesman. Archived from the original on 3 January 2008. Retrieved 19 October 2007. 1 2 Santas 2002, p. 18. ↑ Gokulsing & Dissanayake 2004, p. 32. ↑ Goristas, Helen (May 2002). "Satyajit Ray". Senses of Cinema. Archived from the original on 11 May 2008. Retrieved 19 May 2008. Bergan, Ronald (2006). Film. Dorking Kindersley. ISBN 978-1-4053-1280-6. Ray, Bijoya (2012). Manik and I. Penguin. ISBN 978-0-143-41625-8. Gokulsing, K. Moti; Dissanayake, Wimal (2004). Indian Popular Cinema: A Narrative of Cultural Change. Trentham Books. ISBN 1-85856-329-1. Gokulsing, K. Moti; Dissanayake, Wimal (2013). Routledge Handbook of Indian Cinemas. Routledge. ISBN 978-1-136-77284-9. Gugelberger, Georg M. (1996). The Real Thing: Testimonial Discourse and Latin America. Duke University Press. ISBN 978-0-8223-1844-6. Robinson, Andrew (1989). Satyajit Ray: The Inner Eye. University of California Press. ISBN 978-0-520-06946-6. Robinson, A (2003). Satyajit Ray: The Inner Eye: The Biography of a Master Film-Maker. I. B. Tauris. ISBN 1-86064-965-3. Santas, Constantine (2002). Responding to film: A Text Guide for Students of Cinema Art. Rowman & Littlefield. ISBN 0-8304-1580-7. Wood, R (1972). The Apu trilogy. November Books Ltd. ISBN 0-85631-003-4. Bandyopadhyay, Bibhutibhushan (1999). Aparajito. HarperCollins. p. 478. ISBN 978-81-7223-320-4.